“Whether, the non woven fabric is tax free under entry 51 of Schedule B of Haryana Value Added Tax Act?”. The main extracts from this clarification are produced here for the general information. The applicant – Jasch Plastics India Ltd. – is a manufacturer of non-woven fabric. The applicant states that non -woven fabrics are tax-free as per order of assessing authority, Bhiwani but another view may be expressed by assessing authority, Sonepat, therefore, a clarification is sought to know the correct liability of tax. Non-woven fabric, also known as ‘technical textile’, is used in manufacturing of air-filters for automobiles, surgical disposal caps, masks, vacuum cleaner bags, carry bags, for inner lining of suits, padding of shoulders etc. The applicant claims that ‘non woven fabric’ is a variely of textile and tax free under entry 51 of Schedule B. The applicant has relied upon the judgement of Supreme Court passed in the case of M/s Porritts and Spencer (Asia) Ltd. Vs. State of Haryana (1978 42-STC-433). The applicant has also relied upon the judgement of Supreme Court in the case of Delhi Cloth and General Mills Company Limited Vs. State of Rajasthan (1980) 46- STC-256 (SC), wherein the Court held that “fabric covers all textiles no matter how constructed”. Perusal of the above entry reveals that only ‘textiles’ fall within the purview of this entry. The word ‘textile’ is derived from Latin word ‘texere’ which means ‘to weave’. When yarn, whether cotton, woollen, silken, rayon, nylon or of any other description is woven into fabric, what comes into being is a ‘textile’. The method of weaving adopted may be the warp and weft pattern which involves interlacing a set of longer threads (called the warp) with a set of crossing threads (called the weft). This is done on a frame or machine known as a loom. With the advent of science and technology there may be various processes or techniques of weaving. Whatever be the mode of weaving employed, woven fabric would be ‘textiles’. Fabric, on the other hand, is manufactured through weaving,knitting, spreading, crocheting, or bonding. Thus, ‘fabric’ is a wider term which includes woven fabrics (textiles) and also includes non woven fabrics, but the term ‘textile’ is restrictive which includes woven fabrics only. Non woven fabric is manufactured from Polypropylene Granules by adopting ‘Spunbond technology’. In this technique PP Granules are fed to the Hopper and at a certain temperature they are pressed through the extruder and melted. The molten polymer is filtered and passed through spinning unit and directly converted to numerous filaments called Polypropylene filaments. The filaments are laid in the form of continuous web on a conveyor belt. Under controlled pressure, thermal bonding of filaments eventually results into formation of non woven fabric. 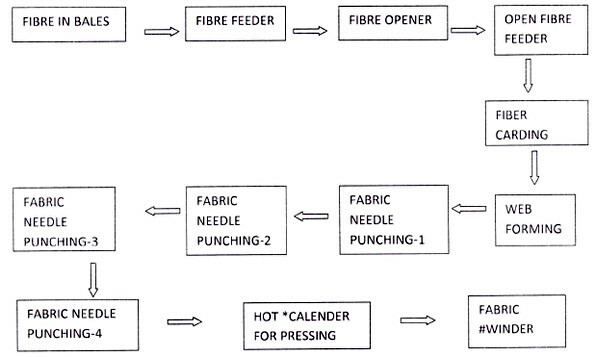 The flow chart for manufacturing of non woven fabric as obtained from the applicant is shown in Figure1. The flow chart reveals that neither yarn is used as raw material nor process of weaving is undertaken for manufacturing of non woven fabric. The judgment in the case of Delhi Cloth and General Mills Ltd. vs. State of Rajasthan and others relied upon by the applicant is distinguishable. The Supreme Court, in that case interpreted that the term ‘rayon fabrics’ falling in item 18 of the Schedule to the Rajasthan Sales Tax Act, 1954, also included ‘rayon tyre cord fabric’ manufactured by the petitioner. Entry51 of Schedule B appended to the HVAT Act uses the term ‘textile’. In view of this interpretation of the term ‘textile’, the non woven fabric cannot be treated as ‘textile ‘. Entry 51 of Schedule B which exempts “All varieties of cotton, woollen or silken textiles including rayon, artificial silk or nylon” is restricted to textiles only. Therefore, non woven fabrics do not come within the ambit of entry 51 and are not exempted from levy of VAT. The product non woven fabrics do not fall in the list of Goods of Special Importance mentioned in Section 14 of the CST Act, 1956. The product is also not covered by any entry of any Schedule appended to the Act, therefore, is an unclassified item liable to tax @12.5% plus 5% surcharge. The matter is clarified accordingly.